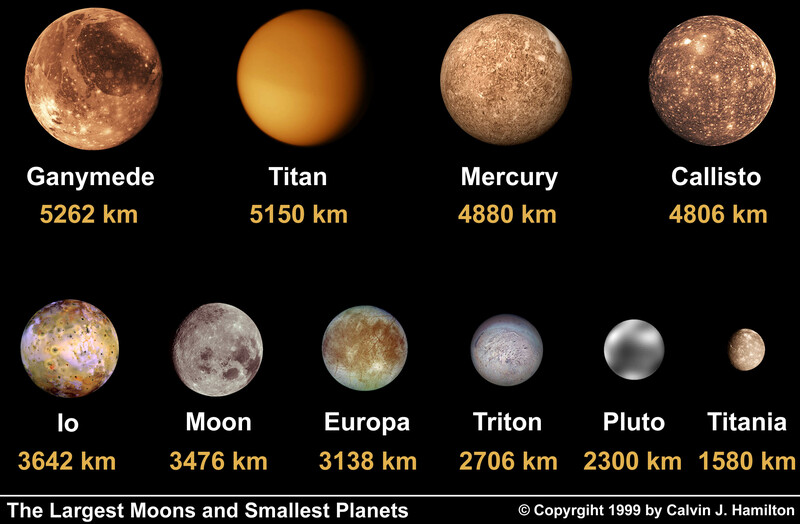 This image shows the relative sizes of the largest moons and the smallest planets in the solarsystem. The largest satellites pictured in this image are: Ganymede (5262 km), Titan (5150 km), Callisto (4806 km), Io (3642 km), the Moon (3476 km), Europa (3138 km), Triton (2706 km), and Titania (1580 km). Both Ganymede and Titan are larger than planet Mercury followed by Io, the Moon, Europa, and Triton which are larger than the planet Pluto.